It's an investment. Be prepared to shell out cash. You need patience. Lots of it. You will, inevitably, kill your already dead hair. Deal with it. Don't do anything half-assed. Being thorough will be worth it. My very first tip for people who plan to undergo the process of bleaching their hair into near obliteration is to do RESEARCH, RESEARCH, RESEARCH. Google will be your best friend in this journey. Make use of it. Extensive research is highly mandatory because bleach is a chemical that is NO joke (Google images of bleach burns -- yeah, 0/10 would not recommend that to anyone) and should be handled with utmost caution. You should also research on Virgin Coconut Oil benefits for hair and bleaching, color theory for toning hair, and how to do bleach baths. All these will be very important in this journey. Since you're here reading my blog post all about achieving the hair of your dreams, I'd say you're off to a good start, yay, you! Second step, do research at your local salons about hair bleaching -- getting your hair bleached professionally IS expensive BUT you'll get better results with it compared to a DIY at home. Either you spend and garner great, successful results or you take the big risk and pay the consequences of being cheap. What are the risks, you might ask? Fried, gummy hair, that can break off at the top of your head, bleach burns on your scalp which can result to bald patches, etc etc. Not a very pretty picture, huh? While doing research, don't just go for the cheapest salon you find. Just because they do bleaching services for cheap doesn't mean they'll do a good job. I was lucky enough to find a salon who really values their business and are very professional -- they would die before they let you walk out of their salon looking ratchet.South Salon did my first bleaching process + toned my hair for a total of PHP 5,000 ($115). There was no way they were going to let me walk out of their salon with extremely ugly orange hair, so they toned it with some green based toner which canceled out the ugly orange and turned my hair dark ash blonde. DO NOT, FOR THE LOVE OF ALL THAT IS HIGH AND MIGHTY, DOUBLE PROCESS YOUR HAIR. Double processing means bleaching twice in one sitting, or within 1-2 weeks. That's the most stupid thing you can ever do to your hair. Please. Better safe than sorry. I waited one whole month before undergoing the second bleaching process (that's minimal waiting time, it's recommended to wait at least three. I'm impatient.) In the month that I waited I did weekly hair DIY treatments at home. Virgin Coconut Oil is your best friend. Honestly. It's the best thing out there. Do VCO hair masks and deep conditioning hair masks(there are tons of tutorials online, and you can use deep conditioning treatments you find in your local beauty supply store)at least 4-5 times a week, alternating each mask. VCO strengthens hair, while deep conditioning treatments moisturize your hair. They go together like bread & butter. 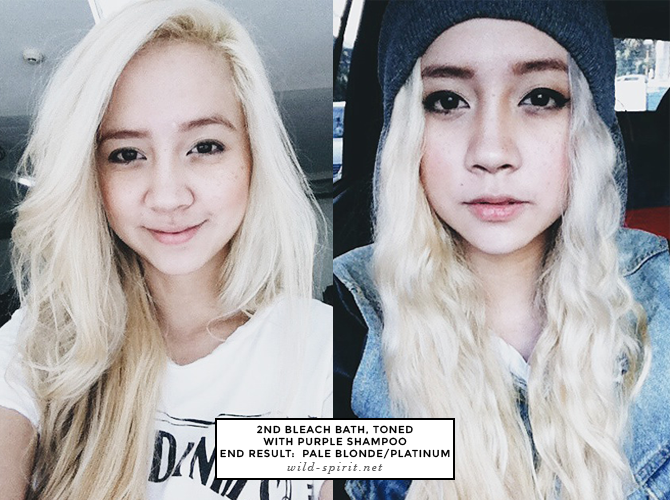 After a month of absolutely babying my hair, I went for my second bleaching process. My hair turned a very yellow/gold color. South Salon toned it to cancel the yellow tones and ended up with a nice ash blonde color. You'll notice that the top half of my hair is lighter than the bottom half, this is normal because the hair at the bottom half is older hair and is more damaged than the newer hair above. I babied my hair for another whole month, and then proceeded to do bleach baths (don't forget to soak your hair in coconut oil before bleach bathing) on the bottom part of my hair to match the top half of my hair. I believe it took me at least two bleach baths, spaced in between two weeks, to get the bottom to match the top. I ended up with light blonde hair. At least two more shades until I get to pale blonde. My second bleach bath got me to a very pale blonde stage, this is the kind of shade you need to get to platinum/white/silver hair. PALE blonde. Think inside of a banana color. From here, you tone endlessly with purple shampoo to cancel any remaining yellow hair. If you're wondering how purple shampoo does this, this is where your 'color theory for hair' research comes in and helps you understand. 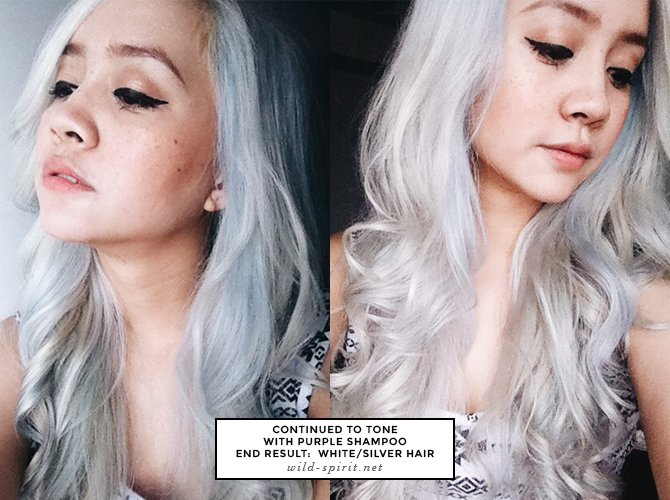 As I continued to tone with purple shampoo, I ended up with white/silver hair. You can stop toning once you've reached your desired hair color and only tone again when you start to notice the yellow shades coming back. I would like to note that just because you've reached your desire hair color, doesn't mean you should stop babying your hair. I have encountered terrible hair breakage, and so I had to continually baby my hair for months on end. You can also look into Brazilian Keratin Blow Out treatments. I had it done before and it really helped my hair A LOT. 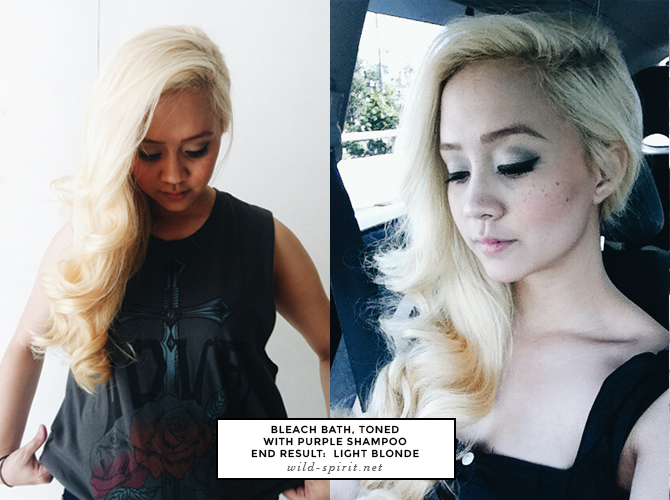 It's a temporary fix that will last at least 4-5 months on extremely damaged bleached hair. 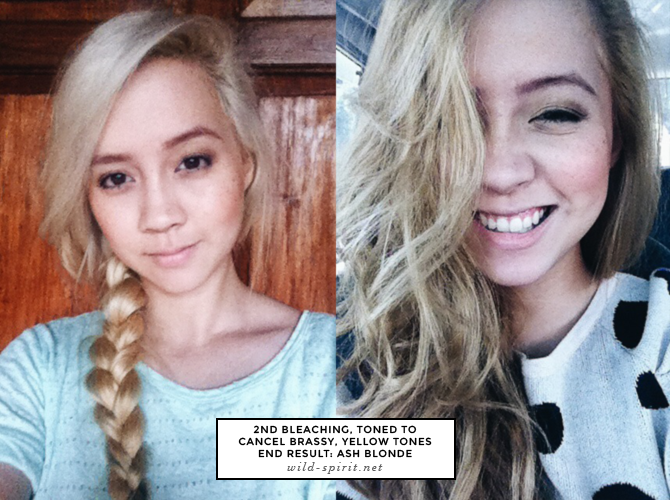 I think I've covered everything you need to know about hair bleaching. If there's anything I've missed, don't hesitate to let me know, and if you have any more tips/tricks you're welcome to share them as well at the comments below! This is going to get a little emotional.